In this on-demand webinar our experts are focusing on some of the unique challenges that small and medium businesses might run into and why the right software is key to overcoming those challenges. You will also hear about how help desk and remote support software can pay for itself. Additionally, our experts will demonstrate relevant features of the SolarWinds® Web Help Desk® and Dameware® Remote Support tools. All right everybody, looks like we are ready to get started. Again, this is How Help Desk and Remote Support Software pays for itself. Welcome and thank you for joining us. A few housekeeping items to review before we get started. We're going to have this session going for about 60 minutes today. Forty-five of that will be our presentation and then we'll allow 15 minutes at the end for Q and A. We have a group here, ready on chat, and we encourage you to send questions throughout the presentation. Any that you have, just send them to the group and we'll make every effort to address them during this session. And whatever we don't get to during the sessions, we'll address in Q and A. We also really like to make these webinars as interactive as possible, so you will see some polling questions popping up. And that really helps shape the conversation in real time. So, we appreciate your participation. So, let's get started here. One of the things I always want to take the time to highlight is the SolarWinds maintenance program. SolarWinds really offers one of the most robust renewal programs in the industry and the first year of maintenance is included in the cost of your license. A few key benefits included are that all the upgrades and product releases are at no cost to you. We have 24/7 live technical support and, my favorite, is you have virtually unlimited live instructors that lead training via the customer portals. So, you can really take advantage of the training, not only for yourself, but for your entire team. So, participating in today's webinar, we have Doug Tedder of Doug Tedder Consulting and he's going to help lead the conversation on really why Help Desk Software and Remote Software are really important to small business. Ted comes to us with over 25 years of experience. He holds numerous industry certifications and disciplines, ranging from ITIL to Organizational Change Management. And, I do want to give Doug a big congratulations because I just came across an article where he was named one of the 20 Unsung ITSM Social Influencers by ITSM Tools. So, congratulations, Doug. You're welcome. And, of course we've got Aaron Richardson. Aaron is our lead Sales Engineer. He always has the right answer for the problems I constantly bring him. So, he really cut his teeth in IT working at a help desk while attending college. He draws on nearly 15 years of experience assisting customers and finding those right solutions. And he's helped numerous businesses improve their internal processes and work flows. He's really knowledgeable about the problems that the IT department faces and really the importance of IT in any organization. So, we're glad to have both Doug and Aaron for our talk today. My name's Karla Palma and I'm the Marketing Manager for Web Help Desk and Dameware. So, let's get moving here. “Start with SolarWinds” is a three-part series that we put together, and we really developed it for the small and medium size business. We have two additional webinars coming up. So, this second one will be how to easily automate backups and simplify log message management. In addition to that, making sure your file transfer data is secure, while reducing digital clutter. So, you'll see more information in a follow-up email if those are of interest to you in your small business. So, as we were crafting this webinar, we wanted to really hone in on things that we need to take into consideration for our small to medium businesses. So, really five things rose to the top: the need to work smarter; having a limited IT team; of course, affordability; the need to have software that's easy to use; and then also software that addresses security concerns. Now, Doug, I know that one of the key things that you drive home on this webinar is insuring that small to medium businesses really put their resources to work and work really smarter. Can you expand on what you mean by that? Sure, you know, you got there in the second bullet point there and that's kind of where I would start with this. None of us have the luxury of having a one-to-one ratio between IT technicians and the customers that we're serving within our businesses. So, it really behooves us, as IT organizations and IT professionals, that we really have to work much, much smarter. What does that look like? Well, doing things right the first time, eliminating the redundancy and the kinds of work efforts that we're doing, and support of our customers. We have to get more done with a limited number of resources. So, we have to really work much smarter at the kinds of things that we're doing in order to deliver the kinds of services that our businesses need. Sure. And Aaron, I know that you've had hands on experience working with small IT groups that end up with a lot of responsibility. So, ease of use, I would imagine, is really key when you're working with small IT teams? Yeah, ease of use is really what drives everything within a small IT group because you’ve got to consider that, in those small IT groups, everyone's wearing a lot of hats. And so, a lot of time spent on very difficult to use program, or a program that requires a lot of hops and jumps to do what should really be some simple things or some intense programming to get those things done, just isn't going to work. Sure, and obviously, I mean, one of the things that we also have to touch on is affordability for a lot of these software programs. I know that from a small to medium business perspective, we have to stretch those budgets and ensure that, that software that we are investing in has that value that we're looking for in the long term. Yeah, absolutely Karla. And one of the key things here, and that gets back to the wearing the multiple hats, when you're a small IT shop, you don't want to manage a lot of applications that are going to span the multiple disciplines, right? HR, for example, finance, and those things that often our end users will want to command through. So, having a tool that can do that multi-disciplinary approach is a very important thing. So, that leads us into the first question that we want to start with, and that is, why should everybody start with a help desk support solution? Doug, I know that you've helped hundreds of businesses. Specifically, with help desk software, can you talk a little bit about how it really helps in the end, saves you money, and literally pays for itself? Well sure. When you think about a help desk, it's that central organization that companies look for, for helping with their IT technical issues or facilitate using in a new program or software or getting a new PC up and running. It's really easy to get lost in all of this. Think about it. The alternative here to having a centralized help desk software is, you're doing things on an Excel spreadsheet or you're trying to keep up with it on a white board. And with the demands of the business, it's very difficult to even keep that up to date, much less, accurate. This is where a help desk software can really become very powerful and very helpful. It provides that one single source of information and knowledge about what's going on, not only within our environment, but with our customers. It helps us work much better as a team. Like Aaron said, we're all wearing multiple hats. And so, if I'm off working on a router issue somewhere and Aaron's off working on a PC issue, we each must have an awareness of what the other is doing so that we can coordinate our activities, perhaps. And we have to enable that better customer experience for our consumers. The last thing that they want to hear when they're having issues with their software or their particular device is an IT organization or an IT technician that doesn't sound like they understand what they're talking about or even knowledgeable. And these are some of the areas where a help desk software can not only give the right appearance and project the right image of the IT organization, but, in the long run, will actually save you some money. Yeah, Doug, and that's really why I have a slightly different view, I guess of a lot of people, for what a help desk solution is. I look at it as a communications platform. It's that enabling us, and you talked, you know, very well about needing to know and awareness of what's going on, and, you know, to use you as an example, what Doug is doing, what Aaron is doing. Communicating that back into our end users, right? So, I see a help desk solution, really, as a communications platform. How can I get as much information from my end users so that I can quickly address their problem, efficiently, right? How can I, as a technician, communicate with my other technicians? And, just enable everything within the organization. Yeah, you got a great point there. And the other aspect of that is, not every issue can be solved immediately, and maybe, using our analogy there, maybe I have to come back, and maybe get another cable or something else. The customer may have to call back in. We don't want to have to start the conversation or communication all over again with, you know, “what is the issue?” We have to have a place to where, every time the customer calls, we can accurately and effectively communicate with that customer about how they're being responded to, what work we're doing to help them, so on and so forth. So, I think you're spot on there and it really is a communication enabler. So, what I'm really taking about, is at the end of the day, a help desk software is going to help you keep track of the tickets, but in addition to that, it also allows you to have that department communication for real great efficiencies that can happen when that communication line is open. 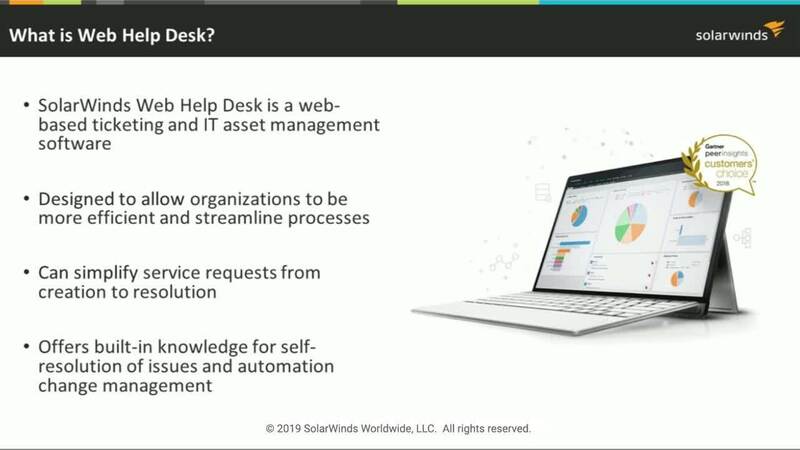 Now, I want to talk a little bit about Web Help Desk® and what Web Help Desk is and why it's a little bit different from some of the solutions. I want to take a quick note and pat ourselves on the back, because this year we were designated a 2018 Gartner® Peer Insights™ Customer Choice for IT service management. And the reason that that designation is really exciting for us is because the Gartner Peer Insights Customer Choice Designations are voted on by customer feedback. So, the more feedback that customers provide to Gartner and the more reviews about your software, that's what they use to actually take this into consideration. So, for us, that's really, really important in listening to what our customers want and what our customers need. Now, Web Help Desk is a real feature-rich solution. Aaron and I know that customers specifically use Web Help Desk to automate ticketing, for assets management and change management function. Can you talk to us a little bit about each of those functionalities and, more than that, kind of address, what do they mean to a small community and business? Right, so the overreaching thing that I think is important to keep in mind, and what I'm always talking about, is when I say “What is Web Help Desk,” I say "it is that communications platform.” So, everything that will drive that communications aspect. So, when we talk about web-based ticketing or we're talking about us getting that information from our end users, setting the expectations with the end users on when we're going to be done. Every time I do an update, I want my end user to know about it so they’re not always calling back in looking for that update. I ask that management has a way to not only know what I got and get away from my spreadsheets, which quickly get outdated, but also to populate into the ticketing information so that we can more accurately know, as technicians, what we're working on, what's been done before on the reporting side, and where are we seeing a lot of problems. So, centralizing all of this with that viewpoint of a communications tool, right? If we only have, you know, just ticketing, okay, it does that. Asset management, yes, it does that, but the essence of what it is and the essence of what's going to drive us to be a better and more efficient organization is that communications aspect. So, when you say asset management, the difference between the asset management and asset tracking, per se, is there a difference that we should be aware of? So, when I'm talking about asset management, it's really knowing what we've got, where it is, who's got it. Being able to do that in an automated fashion as opposed to a simple spreadsheet that says, you know the last time I updated this, which could've been a week ago, this is what we had, and I think this is where it was, right? So that automated tool is going to go out and do these things for us. Got it. And then, from a change management function, I know with all of the current security in place that a lot of different industries need to have. Can you walk us through the change management function in Web Help Desk and what it actually does? Change management is really a different thing almost to every single person that I talk to, right? And I'd love to get Doug's take on this, in just a second. To me, what the real key things about change management are, how we are communicating that within the organization. What do I have out there? What needs to get updated? Who's taking a look at my update procedures? When are we going to update these things? And really, in its essence, what we can do is we can boil these down to a series of tickets. These tickets then, can track. Who proposed it? Who has taken a look at it and analyzed the impact? Specifically, what impact will those things have? An approval processes, because those are key. Who took a look at it and approved that change before it was made, right? Because all this is going to come back to, at some point in time, that auditing trail. Who said that we can do that? When did they say that we can do that? How can we prove that they said they did that? Email is a really poor way to do that. Doing it through something like a help desk solution, where you've broken this out into a series of tickets. They can all be correlated against each other. That really helps us to streamline our processes. Doug, what's your take on that? Yeah, I have a very similar thought around change management, to your point. First and foremost, change management, it really is a communications process, if you will. Making sure, what I like to tell my customers a lot of times, is that if it only took one of us to do IT within our organization then what's the rest of us doing here? And just by the fact that we've got more than one person in our department, we have to coordinate our activities, and so change management really gives us an opportunity to communicate that. The other thing that change management does, and you kind of eluded to this, is it helps us understand an optimized risk. No change is without risk. Every change has some risk. Some changes have more risk than others and we want to make sure that we've done our due diligence, if you will, to make sure that we understand what that risk is, that we've optimized it, that we're prepared in case something goes wrong. These are the kinds of things that change management allows us to do. And then the last thing that I would say about change management is that it really is a proactive approach to not having outages. If we're doing things well with change and doing them right the first time, then that means that people are not having to call the help desk because of an issue. We've done a good job of testing, we've done a good job of actually rolling out change, we've done a good job of communicating the change. And you know, the other thing I'd like to say about it, is it helps us keep score. When we do things well in IT and changes are going in right the first time, we should keep score, and that gives us an opportunity to help the businesses understand the value that we're bringing by following these processes and having a help desk that allows us to do those kinds of things. Perfect, well will you give us a quick demo of Web Help Desk, so we can see what the capabilities are, Aaron? Absolutely. And so, as I bring this up, what I'm going to do is I'm going to, first take a look at it from the stand point of my end users, right? What we can get from our end users is almost as critical, if not more, so than just that they have a problem. We all, in IT, hate that email that says, “My stuff is broken.” Well, help me understand what you mean by, “My stuff is broken,” right? So, we can present a web portal that helps our customers walk through the process that they've got. It's a customizable portal. From the school of Aaron, I like to build things up very, very broad and guide my end users through the process of understanding what they've got. So, as an example, facilities, finance. And this gets to that multi-disciplinary approach. I can present to my people, whatever it is within the organization that they need help with. A central repository to put in a request, right? So here I'm going to pick on the HR group, for an example, and we'll see a few things. As I build this out, I can present a knowledge base for those frequently asked questions, right? So, as they're beginning to populate out an HR request, what kind of things are they inclined to read, and if so, will they help themselves? If they want to, then we can present those FAQs. And then, along the way—and this is just for showing, not necessarily an HR thing—so, we can associate the assets that are associated with the person who's submitting this request. In this case, Aaron. As he's coming in, he can say, it's this particular asset is what's giving the problem. The technician on the backend then already knows what we're looking at—what we need to dive in and investigate. And then, as they continue to drive through, we can do things, and this is an important aspect, within all organizations and as I do a lot of my calls and my demos. What resonates with, I would say 90% of the people, is that multi-disciplinary approach. And every time we talk about, “how do we bring onboard a new employee?” that's maybe the top thing that's in conversations within the organization. Especially, in that SMB area, right? How are we communicating with the different functions? How is HR receiving their information? How is IT receiving its information? But with a customizable portal, what we can do is, we can not only ask for, but in fact, demand certain bits of information that will allow us to do our job. So, as an example, what in this case I'm requiring? What kind of systems does a new employee require? (And I'm presenting a multiple-choice option here.) I can also pass along information to my end users—who, maybe this is their first time asking about it—to let them know what our expectations are. In this case, the onboarding. You’ve got to give us at least a week to get things done because if you're not giving us that amount of time, then really, you're not treating us fairly, right? Which, I'm not going to say it never happens, but, you know, it can happen. So, with that, we can present to them and this is easily customizable, and I can show that here in just a second, just how easy it is to come in. It doesn't require a degree in computer science in order to make these changes. But from the end-user perspective, that is really what they're looking for. We can give them a history of their tickets, we can allow them to research their own assets. Approvals, we touched on that when we were talking about change management. What approval can take, can present itself within the organization, really at any point. When we're asking for new hardware, we may need an approval from the CFO or the Controller or the President of the company, to say, “Yes, it's okay to go out and purchase this capital equipment.” And then we can present bulk messages. And this gets to one of the things that Doug was touching on earlier. If we know about something, you know, if we've taken our steps, then we can present to our end users, an area where they can land when they come in to say something. So, for example, if we bring down our exchange environment at 2:00 a.m., and somebody just happens to be up at 2:00 a.m. and they see that their emails not working, they might come in and try to open a ticket. We can present to them a quick note that says, “This is what's going on in this area.” So, with that, Karla, I'm going to switch on to the back end and I'm going to touch on some of those things with regard to set up, right? Because that gets key to what we're talking about when we say, ease of use, right? So, when it comes to doing a setup, you'll see, I've created a number of things here that I don't always present to my end users. And there are reasons for that and they can be various and sundry within the organization. But if I want to create a new one, what it looks like is, me coming in and setting up my new request type, and if it's going to be a child to some other request type, I simply come in and select that—if it's a finance, if it's HR, or an IT request. Whatever it happens to be, I can create a new software request for access, maybe. Access to, you know, whatever. Some CRM, some ERP, something along those lines. Once I've done that, I'm going to assign it to a tech group. And that's one of the beautiful things about Web Help Desk is, that by assigning these things to tech groups, we can automatically get assignments for these tickets to the right person, right? …that just came through. Can FAQs be automatically generated as the system gets populated with tickets? That's an interesting question. Can it be automatic? It can be as automatic as the technician, defining what they want that to be, right? So, let me give you an example. I'm going to switch over to look at this ticket. So, this is an email-generated ticket. And while we're on the subject, I'll point out that, within IT we know that there are four ways to generate a request, alright? We've got the portal, which we're presenting. We can bring it in, via email, we can take our phone call request and then everybody's least favorite is the ambush method, right? We want to optimize the first three, so we can reduce the last one, right? Now, when it comes to setting something up for you know, that automatic FAQ generation—I'll just show quick. If I'm working on a note and I've fully documented it, everything that I've done, typically this is going to be my last note. Then what I can do is I can create what I call a “FAQ on the fly.” And this is the technician coming in and saying, “I believe this is something we should publish to our knowledge base.” By creating this FAQ from right here, from within the note, then I'm putting it out and I'm allowing my knowledge base administrator to look at it and determine who the audience should be, whether we're going to limit it to specific locations, specific groups. Whether it's technicians only or the entire organization. Different things like that. That's a great question. Got it, thanks for answering that. Um hm. And just to finish off on that set up question that we had earlier. So, we were taking a look at how easy it is to create a new request site and where that would populate, right? We've given it a name and we assigned it underneath a parent area, so in this case, we'll just say it's going to be a facilities request. We assign it to a tech group because when this comes in we want it to be automatically assigned to the right people. Now, the school of Aaron again, says that I don't allow my end users to define their own priority because they tend to always go with the highest one. What I tend to do is, I will give something a default priority and then, in communication with the customer, once the technician gets that ticket, determine if we need to elevate it or not. So here, I can determine if I'm going to use those computer models, I can decide “yes” or “no.” Companies locations departments, whether it's going to be visible to, is there an approval process that it needs to go through. Once I've done all of that and I hit “Save,” I'm done. You can see that there's no complex coding or anything like that. I hit save, and now, if I've made it visible to my clients, it will appear on that portal. So really, this gets back to that ease of use. And then one last thing to wrap up this part of the demo, Karla, is touching on the notion that we need to communicate better with all of our organizations. So, we can kick off a series of tickets from a single request. That HR onboarding request, for example, in the environment that I've got set up, fires off five immediate tickets to different groups and different people. And it all depends on our organization and how we want to structure that. So, Aaron, let me just interrupt really quick. So obviously these are tasks that can be configured to what the company needs. If they need a specific, three specific things to happen when a new employee gets onboard, what happens is you've already pre-populated this and the way you kick it off, those tickets are automatically sent? That's correct. We understand our own processes. We've got them fairly well documented. We know that we need to follow the same process every single time so we're going to plug it into the system and let it automate. Now, the beautiful thing about this is, I'm showing HR onboarding. This could be a change management process and we know that it needs to follow the same set of steps. So, we can program in something like that. And then, if there are scheduled things that we need to do, whether that's going out and starting a server, whether that's, you know, and in this case, I’ve got air filter replacement, just as an example. Those things that we can do, and we know that we've got to do by a certain date and time, we can document who did it, and then we have that audit trail, right? So, if we've got to restart that server every quarter just to avoid any problems, we put a ticket in for that and it self-fires. We don't have to set up some kind of weird reminder in Outlook or something like that. Yeah, I love it and, you know, these are things that really resonate well with the customers that I'm talking with. Perfect. Well, thanks for walking us through that demo. Now, I guess the next question here is, we walked through why a Web Help Desk, or a help desk, is important to small business. Why should everyone also consider Remote Support Software? Because, one, I guess we want to really understand, Doug, and maybe you can help me out here. I know that reducing time to resolution is one of the most important things that you think an IT department needs to focus on. Can you speak to that now a little bit? Why is reducing time so important? Yeah, I think that's a great point. Especially when it comes to remote support kind of software. When you think about it—and this is what I like to tell folks that I work with—any time your end user calls IT support, your company's paying for IT twice. You're paying your service desk, or your help desk technician. You're going to pay them anyway to do IT kinds of work. But then we're also paying for that end consumer or end user to also do IT work while they are working with your technician. Now, why does this make a difference? Well, one, we're paying twice for IT. But the second issue is that, while the user is down and they're unable to do their jobs, then the cost really starts to add up very quickly. So, we want to be able to respond as quickly as possible. And, back to the thing I said earlier, there's never going to be a one-to-one relationship between IT technicians and those that we serve. So, it's very important to make the best use of our resources, and this is where a remote support tool could be very helpful. On one hand, it's nice if our technicians can get out and get a little exercise and walk over to the customer—and sometimes those kinds of things must happen. But in a large majority of cases, just being able to remote into someone’s system can save so much time, not only for the end user, but also for the IT technician and—oh, by the way—that frees up their time to work on, perhaps other issues that have come in. Whereas, if they were out traveling, these issues are piling up and the technician has no awareness of them. So, this is where I think reduce-time resolution becomes very critical. We want to optimize the use of our human resources. Sure, that makes sense. And I know that, Aaron, one of the things that we keep going back to is ease of use and how important that is. Why is that important with the remote support tool also? Because I know that there's a variety of them out there. What is probably the most important thing that you think a remote support solution should do? It should make that remote connection. And it should do it in a way that's easy to find, easy to get to. Some of the top things that I hear when I'm talking about a remote support tool are how easy is it for my end users to let me know where they are so that I can quickly get into that system, right? And as Doug touches on, you're paying twice. If your end user is down, they're not doing their job, so you're paying for that, and then your technician typically has a hundred other things to do. So, the amount of time that he spends trying to find that system, get it back up and running, and take care of whatever problem that was presented, it is time that's costing the company, and in a lot of cases, specifically that individual technician, because now, as Doug was saying, he's falling behind in the various other things that he's got to do that day. So, you know, it's not just a matter of money to the company, it's also a fair degree of how far behind is this putting that technician? How much stress are we putting on them to get their job done so that the business continues to operate? Sure. And I think, lastly, one of the things that we wanted to touch on being, you know, we often see that there are a lot of free solutions out there that folks can sometimes download for remote connection. But I know that one of the most important things that a remote support tool does need to have is the ability to provide a safe connection because, you know, currently, everything that is out there and all of the different issues from a security perspective that a company can have if they don't have a secure solution to help with a safe connection. What do you think about that, Aaron? That's actually a really great point because I talk to a fair number of people and there's a number of ways that we can look at a safe connection. One way is just encryption and making sure that we encrypt everything that's coming and going over the wire between me, as the technician, and whoever that end user is. And pretty much everybody takes care of that. And so, if that's all that's being sought after then, you know, great. That's something that can be resolved. But we need to make sure that we are doing that because there's plenty of examples of people, sales guys. And, when I was in a different life, showing up at Panera [Bread®] 30 minutes before a meeting and trying to get some work done. And if you can't get that work done then, you know, just calling in, but you're at an exposed point. And so, anybody with the right tools could then see into an unsecured connection. Another area that we have to look at, though, is what points are we hopping through to make that connection? And there's a fair number of organizations, for compliance reasons or whatever—you know, internal business processes—that are simply uncomfortable making that additional hop through a third-party. So, if we can make that direct peer-to-peer connection between the technician and the end user where we're traversing nothing, but our own stuff that helps provide an even more enhanced secure connection. Alright, I know that we were taking a poll just a second ago, and so one of the things that we've been able to take a look at, and Karla, I'd love to have you break this out a little bit more. Yeah, so we thought this was some really interesting information and what you're seeing here is kind of how the HDI Institute divides tickets. So, we have tickets divided into incidents and service requests. With really the big difference being that incidents are defined by HDI as, quote, “unplanned work that requires a physical touch to its hardware fix,” and then of course, “planned service requests.” So, the interesting thing that we note is, we want to kind of call out here is that the average incident time ranges, across industries from 12 to 20 minutes and the average work request averages is about 35 to 95 minutes. So, that's quite a bit of time that the tech needs to focus on these tickets. Yet, part of the equation that I thought was most interesting from this chart is, look at the travel time. The travel time it takes technicians can vary from 12 to 33 minutes on the average. So that is across industry, but in the worst cases, some of these technicians reported almost close to three hours travel time. So, what we know is that when these techs are traveling, they're not being productive. So, to me, I really look at that as downtime for them where they're really not able to move the needle forward with getting, you know, these tickets resolved as quickly as they possibly can, should they have the right tools in place. Let's get to something that Doug was touching on, and you say downtime. I'm going to actually go out and say, it's worse than downtime. It's worse than me as a technician being sick. Because now, I'm not getting something done, right, because I'm in the car, I'm walking to that sight. It's putting things behind. I'm being paid to do it and somebody else is being paid to wait for me to get there, right? And I think, Doug, this is something that you were touching on earlier, is, just that overall cost to the organization for, you know, getting these things taken care of. Right, yeah, it's a monetary cost, it's a reputation cost, it's a reliability cost. You just think about the numbers of ways, when we're traveling, we're not resolving anything. The end user's still suffering from an outage or they can't do their jobs. It just really stacks up. And over time, if this is allowed to continue, we can suffer from reputation damage. Things are always broken, and it takes forever for IT to get out to me to get this resolved. There has to be a better way of doing this. Right, and that's, you know, that's part of the, you know, how is IT perceived within the organization and if we're spending a lot of time waiting to get there, that's only going to impact the way that our people feel about us and about the company overall. So, SolarWinds has a remote support solution, and our remote support solution is Dameware® Remote Support. And, really, there's a couple of really key things that I really like about Dameware. One of them, obviously, Aaron, you touched earlier, to providing that peer-to-peer connection. So that that end user does know exactly what's happening throughout that ticket and assistance of the ticket, but then also is this notion of providing this safe access to computers outside of the firewall. So, I think those are two of my favorite things that Dameware has to offer. What about you, Aaron? What do you tend to really like about SolarWinds® Dameware Remote Support? Well, with all the remote support tools that are out there, right? And it ranges from, you know, a free to a fee-based service. Whether that fee-based happens to be something like some fast-based solutions where paying by the number of end devices that you're supporting, or something like Dameware where you're paying by the technician who's supporting that, which is really an area that caters more to the SMB's. What we're able to do—and one of my favorite things about Dameware is—I can get into a session with my end user and see exactly what they're seeing. So, when they contact me to say, “I have a problem” and then they describe the problem, if I'm using a tool that does not allow me to get in and interact with them in that same exact session, then I'm probably not able to duplicate everything that they've been seeing. If I have to get into a clean desktop and then I have to have them on the phone and describe for me, in great detail, everything that they did to get to that issue. That's taking up a lot of time that, quite frankly, I don't have. So, I really want to be able to get in and see that session, understand exactly what they're seeing when they called me up. Aaron, I'm having this problem, I connected. And I say, “Okay, I see what seeing” or, “Okay, how did you get here?”, “What did you just do to your system to make this happen?”—right? To me, that's some of the strongest points of Dameware, is being able to see what my end users are seeing and help them out in that way. And then, yeah, that safe access to computers outside the firewall. One of the things that, as I talk to different organizations that have different security needs. Whether that ranges from, you know, police and EMS to others, is that we can leverage the NIST standard or FIPS 140-2 to encrypt everything and used an enhanced security algorithm that goes beyond just what Microsoft can provide. Aaron, will you give us the quick demo? Doug, is there anything else that you wanted to add on the remote support solution before we go into the demo? Just a quick note, and Aaron almost said it, I thought he was going to say it. You know, sometimes it's hard though for the end user to articulate what they're seeing. You’ve got to keep in mind, they're not IT people. And having a tool like a Dameware that allows the technician to see what the end user is seeing, we can look at it with a little different perspective of that of an IT technician and maybe pick up on some things that perhaps the end user is either not aware or can't articulate. So, I think that's another powerful feature of a really good remote support tool. Absolutely. So, Karla, yes, I'll show a real quick demo of me getting into a remote session. I'm going to do that because I love the integration points between Dameware and Web Help Desk®. I'm going to show how I would do that from Web Help Desk because, to me, it just streamlines everything so much. So, what I'm going to imagine here is that I'm getting a phone call from a client because this happens a fair amount, right? Maybe they don't come in to the web portal. So, I'm going to look this person up and find out what assets they have, right? And so, when I look up this person and I see that Aaron has, you know, this particular asset he's calling in about, first, I'm going to ask if I can join the session. I mean, it's almost a foregone conclusion that I can because he wants help, but when I click on that icon, and you'll see just how quickly this thing can go. Now it's going to connect me to that session. And once within that session, what I'm able to do is interact with him. So, he gets a little pop up saying, “Aaron has joined.” Now I, as a technician, I suppress the background. I really don't care to see whatever that background is. I like it black, but if you want to see the background, that's perfectly fine. There are a few things that I can do here that I think are really powerful. A lot of times when we're in a remote session, in the past, I've used Notepad in order to communicate something or provide something for that end user. Well, here I can use the chat and I can say, you know, “I need you to do something for me,” right? And I can use that. There's going to be something really powerful about this here in just a second and a couple of things I'll point out. The end user can close out the chat without closing out the technician’s window, but if the technician closes out the chat it closes it out at both ends. And the reason I think that's important is, I like to know that there's not that secret backdoor way for my end users to have that direct path back into me once I've decided to move on from this. I can take some screenshots here. And again, this gets back to, if it's not in the ticket, it didn't happen. If I get into the session and I need to make some changes, or I want to document what I saw when I got there, and I want to document the way I left things, that's exactly what I'm going to do. And you'll see that I'm taking absolutely no care to rename this particular session, right? As a technician, I want my end user to feel like they are my top priority, not documentation. And so, I'm just going to take some screenshots and set them off to the side and when I'm ready I'm going to document this. So now we reach a point within the interaction where we've either agreed that I need to do some more research on this or the problem is taken care of. And so, I'm going to close out this session. And when I close out the session, the integration points, specifically in between Dameware and Web Help Desk, really come into play. They come into play pretty strong. Because I came into this from a phone request, looking Aaron up and then getting into it, the system doesn't know if there's already a ticket assigned. If I got into it straight from a ticket, it wouldn't know what to associate it with. So, it asks me, do I want to create a new ticket, or do I want to use an existing ticket? And in this particular case, I'm going to create a new ticket, give it some meaningful information, a subject, because that would be part of my FAQ if I choose to elevate this in my knowledge base and in description, but here's another point, and this is a point that I particularly love about this. It's doing it in the moment. I have just now disconnected. I'm not able to wait until the end of the day, and that's my inclination, is to wait to the end of the day. If I do that then I lose a lot of detail about that interaction, right? But because this is prompting me in the moment, then a lot more things are fresh in my mind, so I can come in and I can fully document this. It’s also recording how long I was in that session, when did I join, IP addresses, other meta-data like that. So, it's gathering that data. But take a look at this: everything that was in that chat is adding to my ticket automatically. Those screenshots that I absolutely cared nothing about the name because I was trying to help out, but still document, it's grabbing that and it's just going to add it into the ticket. This is going to save me a lot of time. And when we're talking about that guy or that gal with a lot of hats who needs to document it because it's an important part of what we do, but also needs to get back to what we do on the other end, this can save me and let's just say, I like to spend, I don't know, five minutes into the day on each minute documenting. If I do it right in the moment, I might spend only two or three minutes. Over the course of just 10 tickets now, we're talking up to half an hour. And that's half an hour where I can be spending on something else. Getting the rest of the organization, being more proactive in my job or taking care of, you know, that change management that we have to do and keeping everything neat and tidy and all of that. So, to me, that's huge. I click on “Save it to ticket”—boom, I'm done. So, from that technician standpoint, I hopped straight into that session, I spent no time traveling. So, I got back that 10 or 20 minutes, right? And is that round trip or is that one way that we were talking about? But it also reduced the amount of time that I spent on my documentation, and personally, I hate documentation. I don't like having to relive the pain of that interaction just now. And I'm able to move on. And so, with that I close out and move on with my day. I either move on to the next ticket or I can get back to what I was doing when that user contacted me. I think we are getting close to the end. So, just a couple of key takeaways before we go to Q and A. And, Aaron, feel free to jump in here. You've given us some really great demos here. But essentially, Web Help Desk and Dameware support can be purchased together since they integrate so well. Or, if you only need a help desk solution, know that Web Help Desk not only helps automate ticket creations, but it also helps with asset management, which is really key for a lot of small businesses, really understanding where their assets are. And ultimately, I think one of the key things is change management and making sure that you automate as many tasks as possible. Lastly, one of the things that we didn't touch on, but that Web Help Desk also has the capability of, is providing reporting, so that you're able to see at the end of the day, how effective your technicians are and where and when they might need additional support or additional help. And then, of course, Dameware. Dameware really was designed, ultimately to produce time to resolution and to really allow you to connect with your end users, safely. So, most of these tools are easy to use. They're absolutely affordable for the small to medium business. I will tell you now that we only charge for the technician licenses. So, a technician is the person that's actually, obviously going to be using the software. All of the end users—you can have unlimited end users for both of these pieces of software. So, with that being said, let's move on to Q and A. Please put your questions through the chat if you have any. And we'll spend a couple of minutes here. So, with that being said, let's take a look at some of the questions that are coming through. While we do that, Karla, I'll just touch on something that you asked about and that's, when I talk to customers, one of the first things that they always marvel at is, you know, are we charging for that asset management module, are we charging for the KB module, are we charging for the reporting module? And the answer to that is, no. The way SolarWinds licenses these things, as you said, is by the technician. So Dameware is a product, Web Help Desk is a product. Other than that, everything that was seen with the Web Help Desk is included in that license model. Sure. We have one question coming through, Aaron. You mentioned FIPS 140-2. Can you clarify what exactly FIPS 140-2 is? So, the NIST, National Institute Standards. So, in that pop quiz, I just failed that part. The NIST has set up a standard, and it's a standard that's adhered to by a lot of the most security conscious organizations that I'm familiar with. I think we have more. If you want to learn more about FIPS 140-2, you can go to Dameware.com. We offer a little section in there that explains really where that came from. We have another question here. And the question is, when assisting end users that require some level of administrator right, are there any issues with Dameware? Does the end user have to grant an elevated access, if that's the case? That's a great question. The way that Dameware works is when the technician signs in, typically we expect the technician to sign in with administrator-level privileges. And often, that's elevated level privileges above that end user. So, the end user would not grant any sort of elevation in that case, but the technician himself or herself would jump in the session with already administrative-level privileges. Because that administrator is jumping in with administrative privileges, they can make changes to the system, ranging from installing a software, making registry edits, and things like that. So, there isn't really an issue with providing those, Eric. The technician puts those credentials in and you weren't really able to see that when I joined the session because I've got that in my system to remember who I am and my credentials to get in, but that's also a way that we can secure that system. So, if the technician doesn't have administrative privileges into a particular system, they won't be able to get into session. Thank you for answering that. Well, it looks like we are out of time. We want to thank you for taking the time to join us today. Please feel free to reach out to us with any additional questions you might have. Again, thank you for joining us on today's webinar and we hope to see you on our next one, next month. Have a great day.